We’ve now seen sufficient research and information to make it clear: Regular exercise is essential to healthier aging, and even taking up exercise later in life will give you that extra benefit crucial to extending your health span along with your life span. But as recently pointed out in The New York Times, those health benefits can disappear once you stop moving. A recent headline from Quartz basically says it all: Squat, stand, walk, run: New research suggests we should do anything but sit. Citing a new study out of the UK published in Epidemiology and Community Health, the article makes clear that there are truly deadly consequences, for individuals and populations at large, when people remain too sedentary and don’t move. And that movement can be anything from a walk outside to a session at the gym. In fact, according to a recent article in the Wall Street Journal (paywall), it’s become clear that gym membership for people over 55 has skyrocketed over the past decade, from 8.5 million memberships in 2006 to over 13.5 million memberships in 2016. And gyms seem to be getting the message that for many of us, the key to our comfort at a gym is to work with an older trainer. As one older member stated, “It’s hard for someone who’s younger to understand” how your older body feels and moves. Regarding those gym routines, if you’re bored with the same old same old, you may want to explore some new moves to give you more cardio benefit, muscle mass and even improve your mobility. Celebrity trainer Don Saladino touts the benefits of weightlifting for healthy aging and provides seven key movements to make when you hit the gym (along with some dos and don’ts) in a recent article in Real Clear Life. Or, how about boxing for a full-body workout? If it’s appealing to you to pound your fists for a physical (and mental) workout, watch this video of an Arizona gym specifically designed to put the gloves on seniors. Finally, take a look at this new list from Medical News Today that provides the best full body exercises you can perform in the privacy of your own home if exercising at a gym holds no appeal. 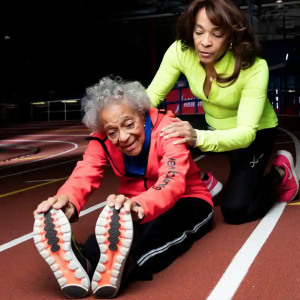 And for some extra inspiration, do a warm-up lap and take a glance at The Guardian’s recent list of some of the world’s oldest top athletes. Most of them didn’t even start their athletic careers until rather late in life, underscoring once again that it’s never too late to develop your athletic potential!